Fianna Fáil, Labour and Fine Gael have all continued their discussion on whether the bank guarantee was a mistake. 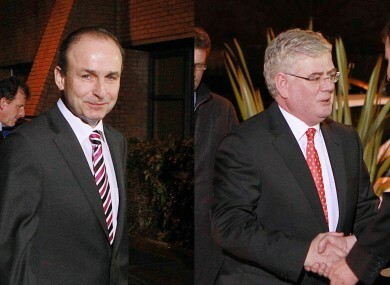 Micheál Martin and Eamon Gilmore were divided on whether the Central Bank had backed the 2008 bank guarantee. THE MAIN POLITICAL parties have driven further policy wedges between themselves in the aftermath of last night’s TV3 leaders’ debate, with parties disputing whether the Central Bank endorsed the government bank guarantee. Micheál Martin and Eamon Gilmore last night clashed over whether the bank’s governor, Patrick Honohan, had found the guarantee to be a necessary measure. While the Fianna Fáil leader said Honohan had backed the guarantee – insisting that the bank head believed the absence of such a guarantee would have led to “catastrophic” bank collapses – Gilmore said the advice was more equivocal. But such was Fianna Fáil’s ire at Gilmore’s remarks that before the debate even stopped for its half-time ad break, Billy Kelleher had issued a press release containing a portion of Honohan’s report on the bank guarantee. Closure of all, or a large part, of the banking system would have entailed a catastrophic immediate and sustained economy-wide disruption involving very significant, albeit extremely difficult to quantify social costs, reflecting in particular the fundamental function of the payments system in a modern economy. When Kelleher’s statement was put to him, however, Gilmore was adamant the support was less than cut-and-dried – and this afternoon Labour’s justice spokesman Pat Rabbitte offered other quotes suggesting Honohan was opposed to the guarantee. As far as can be determined, no guarantee offered by any other government during the crisis covered such risk-bearing liabilities. Earlier, meanwhile, Fine Gael’s Brian Hayes says his party’s view “from day one was that Anglo was a busted bank”, and that the party opposed any plans to try and negotiate any ongoing plans for Anglo. His party, Hayes said, was committed to ensuring that bondholders needed to share some of the burden of funding the banking recovery, but told Newstalk radio that the recovery would need to be on a “pan-European basis”. Yesterday, stockbroking firm Goodbody’s said it felt the government should move to impose a 50 per cent discount on the value of the banks’ as-yet unguaranteed bonds. Email “Parties continue debate over backing of bank guarantee”. Feedback on “Parties continue debate over backing of bank guarantee”.